Idaho Utility Spurns Coal, Pledges 100 Percent 'Clean' Energy By 2045 Idaho Power plans to stop using coal power plants. The news comes as a U.S. energy agency says renewable sources produced a record amount of electricity in 2018. 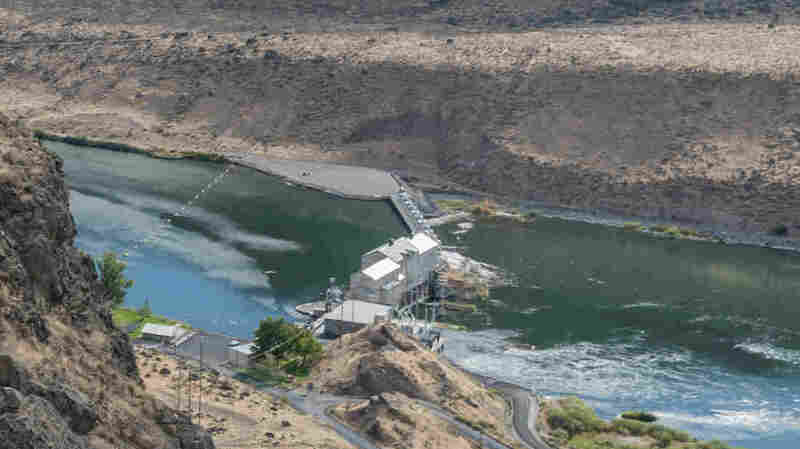 Idaho Power says it already gets nearly half its energy from hydroelectric dams such as the Swan Falls Dam on the Snake River, just south of Boise. The utility plans to phase out its use of coal power plants. Idaho Power says it has already agreed to stop using two coal power plants by 2025 and that it's considering how to shut down its third and final coal plant. "The company that serves over half-a-million customers calls the effort 'Clean Today, Cleaner Tomorrow,' " member station Boise State Public Radio reports. "Nearly 50 percent of the electricity the company currently generates comes from hydro power. About a fifth comes from coal." As it announced the news, Idaho Power also said it has reached a deal to buy electricity from a 120-megawatt solar farm, which will be built south of Twin Falls. That facility is still in the planning phase, and the deal will require state regulators' approval. "Similar clean energy pledges have been made by utilities in Iowa, Minnesota and California," Boise State Public Radio's Matt Guilhem reports for NPR's Newscast unit. Across the U.S., Idaho is far from alone in shutting down coal power plants. As NPR's Jeff Brady reports, the domestic U.S. coal industry is declining — even as exports to China and other Asian countries are rising. "Despite President Trump's effort to boost the domestic coal industry, power plants continue to shut down. They can't compete against cheaper natural gas and renewable energy," Brady reports for NPR's Newscast. "Environmental groups have cheered the decline as scientists warn carbon dioxide emissions will have to be dramatically reduced quickly to avoid the worst effects of climate change." But the agency also reported exponential gains for solar and wind over the past decade, saying, "U.S. solar generation has increased from 2 million MWh [megawatt-hours] in 2008 to 96 million MWh in 2018, and wind generation rose from 55 million MWh in 2008 to 275 million MWh" last year. When hydroelectric power is included, renewable energy sources in the U.S. generated "a new record of 742 million megawatt-hours (MWh) of electricity in 2018, nearly double the 382 million MWh produced in 2008" the EIA says. Idaho Power says it has 17 hydroelectric plants on the Snake River. It also owns three power plants that are fueled by natural gas, which is burned to spin turbine blades and produce energy. The Idaho plan was welcomed by the Idaho Conservation League, which says it has been working for years to see the state's power utility commit to clean energy. "We're enthusiastic about it and eager to continue to assist the utility on how to achieve this goal," said Ben Otto, the Idaho Conservation League's energy associate, in a published statement. "We're hopeful this means they'll work on developing renewable sources of energy built in Idaho by and for Idahoans. That way, Idaho's economy, businesses, workers and families benefit, and we can wean ourselves of a dependence on out-of-state sources of energy." In an interview with the Idaho Press, Otto added, "Climate change and clean energy shouldn't be a political issue." Of the officials at Idaho Power who made the decision for the utility to go green, he said, "They're following the dollars; they're following the science." Adam Richins, the utility's vice president of customer operations and business development, tells Guilhem that the company's plans acknowledge the possibility that new technologies could further reshape how electric utilities serve their customers. "We'll be evaluating all kinds of new, existing and emerging technologies to help us reach our goal," the utility replied. "That includes looking into nuclear technology, such as the small modular reactors planned in eastern Idaho." Nuclear power has deep roots in Idaho. As the Department of Energy has noted, it was a reactor in Idaho that generated the first electricity from nuclear energy, in December of 1951.